We are beginning to see people grow more of an interest in solar power, and it isn’t surprising to us. After all, the consumption of non-renewable energy sources is still not decreasing, but these resources are finite. Many forward-thinkers have turned towards other energy options, such as wind, solar, and water to power their cities and homes. While the use of solar is growing, there is still a long way to go before we use this energy to the best we can. Here are some of the top facts we have learned about solar power and how it affects our world! First, we need to understand what solar energy is. As a form of renewable energy, solar energy is basically just referring to the energy we get from the sun. While the sun has been producing energy for billions of years, we have just recently begun to harness it to light our homes, make hot water, and power our electronic devices. The main benefit of this alternative energy is that it doesn’t create any pollutants in our environment. And, it is one of the cleanest sources of energy. Solar panels don’t need much maintenance once they are set up, and they are easy to install. In fact, the only issue if that they cannot be used at night, and the location of the solar panels will determine how much power can be collected. However, in California, we don’t think that’s much of an issue. 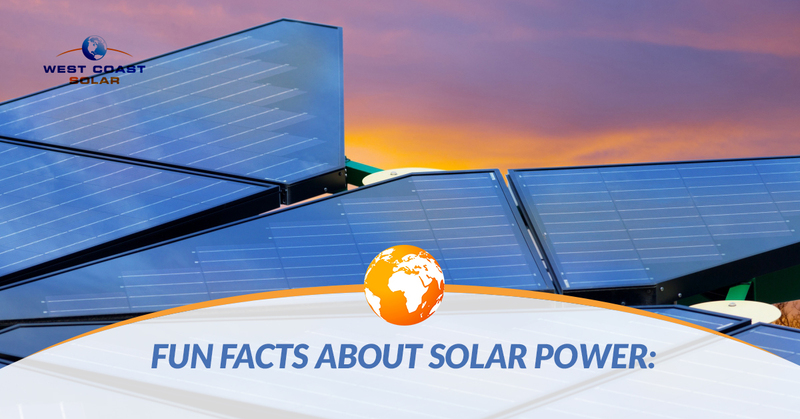 Here are some of the top facts we have learned about solar power and its history! Solar energy is easy to collect, and it’s readily available just about everywhere on earth! Even though the sun is 90 million miles away, it still takes under 10 minutes for the energy to travel that whole way. Solar energy is made up of radiant heat and light from the sun. We can harness this energy with photovoltaic technology, heating, artificial photosynthesis, solar thermal electricity, and even solar architecture. There are two types of solar technology. The first is active, which includes photovoltaic panels and solar thermal collectors. The second is passive, which includes building rooms to improve air circulation or arranging a space in order to receive the most optimal amount of sunlight. The earth’s upper atmosphere receives 174 Petawatts of incoming solar radiation. However, about 30 percent of that amount gets reflected back into space. The rest is usually absorbed by the oceans, clouds, and masses of land. The water cycles we have on earth are an essential part of solar insulation. As our earth absorbs the heat from the sun, the temperature rises. This newly-created warm air rises from the oceans, which causes convection. Once this air reaches high altitudes, clouds are formed from the water vapor. These clouds rain and bring water back to earth to complete the water cycle. Solar energy isn’t just used to power our homes. In fact, through photosynthesis, solar energy is converted into chemical energy for plants to consume. In the end, this creates the biomass that creates fossil fuels. Both horticulture and agriculture need to use solar energy as efficiently as possible. That’s why many professionals use the timing of planting cycles and choosing their plant varieties based on when solar energy is most available. We also use greenhouses to turn light into heat for year-round cultivation of crops that cannot grow in other seasons and conditions. Hot water systems that are powered by solar energy use that energy to heat the water. In some areas of the world, anywhere from 60-70 percent of the water that is used domestically (as hot as 60 degrees Celsius) can be made through solar heating. Did you know that there are solar chimneys? These are passive solar ventilation systems that connect the inside and outside of a building. Solar chemical processes can actually replace all fossil fuels as an energy source. These processes can also make solar energy storable and transportable. Thermal storage systems store heat (solar energy) by using common materials that easily hold heat. For example, solar energy can be stored in stone, earth, water, and molten salts. Fossil fuels were not thought of as being a delicate energy source until the oil crisis on 1970. This is what prompted the study of renewable energy technology and sources, including solar and wind energy. The most common uses of domestic solar energy include cooking and heating water. The earth receives about 1,366 watts of direct solar radiation in every single square meter. The Mojave Desert in California is home to the largest solar power plant in the world. It covers 1000 acres of land. Any event that is temporary, such as a far, mining sites, or the Olympics, are usually powered by solar energy. Since the batteries in solar panels don’t need water or any other service, they are pretty much maintenance-free for their lifespan. Once the panels are installed, there are no recurring costs to pay! Solar power is completely free of noise pollution. None of the parts within it move, and they do not need any fuel other than sunlight to create power. Large investments are the main reason why we do not use solar energy all over the world. We have been using solar energy for over 2700 years. In 700 BC, people used glass lenses to make fire by harnessing the sun’s rays. The sun is responsible for solar power, but it is also the main source of non-renewable fossil fuels. These fuels, including gas and coal, began life as plants and animals millions of years ago. If you are considering going solar, then it’s time to give us a call! We look forward to providing your home or business with a state-of-the-art solar panel system. Harness the sun’s energy and save thousands each year on energy bills! Contact our team today to learn more about our services and how renewable energy can help your home for decades to come.